Chief Judge George H. King announced the passing of Senior District Judge Mariana R. Pfaelzer on May 14, 2015. Judge Pfaelzer was 89 years old. Judge Pfaelzer received her Bachelor of Arts degree from the University of California, Santa Barbara in 1949, and received her Juris Doctor degree from the University of California, Los Angeles, School of Law in 1957, where she graduated at the top of her class. Prior to coming to the bench, Judge Pfaelzer was a highly respected business litigator and trial lawyer. In 1958, she joined the West Los Angeles firm of Wyman, Bautzer and Rothman, and became a partner in a very short time period, playing a major role in building the firm into a litigation powerhouse. While in private practice, she also served as a member of the Los Angeles Police Commission, and as its President from 1976-1978. 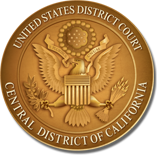 President Jimmy Carter nominated Judge Pfaelzer to be a United States District Judge for the Central District of California. She received her commission on September 23, 1978, becoming the first woman to be appointed to the United States District Court for the Central District of California. During her tenure on the bench, Judge Pfaelzer presided over numerous high profile and complex cases, including the challenge against California Proposition 187, and more recently, nationwide securities class actions against Countrywide Financial. She was also recognized as an expert in patent cases, and was sought out by other judges for her patent case management skills. In honor of Judge Pfaelzer, the flags outside the courthouses of the United States District Court for the Central District of California will be flown at half-mast.